The Seer team keeps a running document of Google search features and oddities, which we collectively update whenever we spot something new. This allows us to identify trends in what features Google is testing and provide our partners with up-to-date information about the search landscape. Here are the new Google search features that we spotted in August 2017 and what it could mean for your brand. The calculator appears below ads but above the organic results, and lets searchers enter in their loan amount, their interest rate, and the load period to determine the monthly cost of payment. They also provide a section option where searches can determine the maximum loan they are eligible for by entering in the monthly payment they can afford, the desired interest rate, and the loan period. This update was originally identified on August 3rd and is available on both desktop and mobile. What does this mean? We haven’t seen any articles written about this new feature nor announcements made by Google about relevant updates, but if this feature sticks, it may spread to other loan queries. 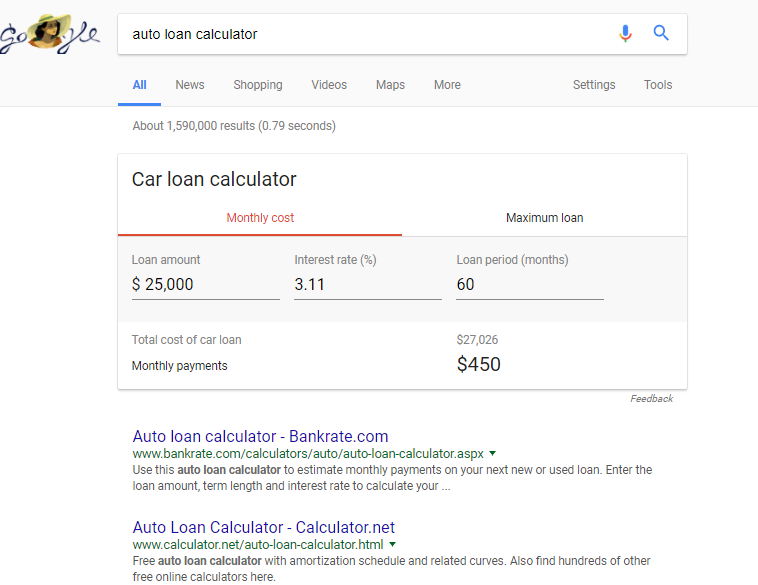 If your company or client has a loan calculator on their site, this might reduce the CTR on those pages as users will most likely see this above organic results. One of our team members noticed that mobile searches were returning different featured snippet results than on desktop. Google was also altering the “People also ask” section with different results for mobile and desktop. 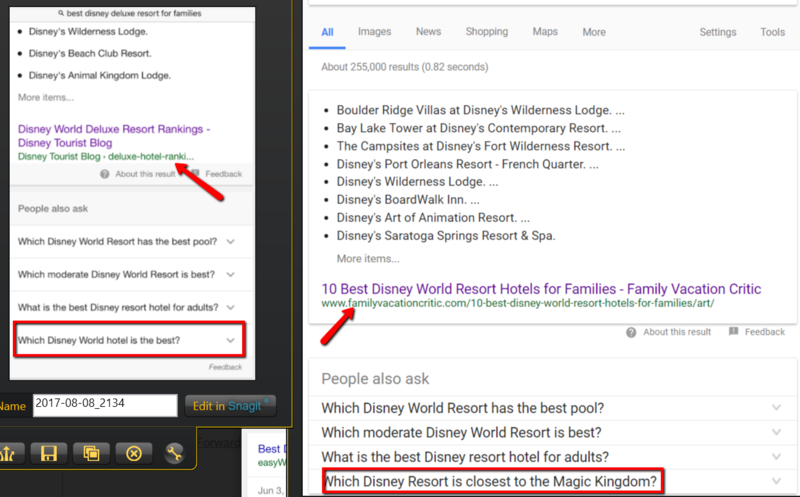 This feature was originally identified on August 8th for the query “best disney deluxe resort for families”. However, the difference in featured snippets & PAA wasn’t triggering at the time this article was written, indicating that it may have been a brief test or may be out to only a select number of users. What does this mean? Since we can’t replicate this again and there’s nothing about this sort of change in any media outlets or news sources, we’re thinking it was most likely a brief test and shouldn’t impact you or your brand. If this is something that Google eventually brings back though, it could affect CTR on mobile vs. desktop for pages that display in the PPA and featured snippet sections. According to one of our team members, a slider of “key moments” appeared in some important figures’ biography results when searching in mobile. At the time of discovery, this feature was appearing for multiple queries including “Jackie Robinson”, “Donald Trump”, etc., however at the time of writing we were not able to replicate this, indicating this may have been a brief test or was only tested with a small group of users. This change was originally identified on August 10th and was only showing up on mobile results. What does this mean? Again, since this feature no longer appears, we’re thinking it was most likely a brief test and shouldn’t impact you or your clients. However, if Google does bring this back or roll it out to a wider audience it would be interesting to find out what structured markup would trigger these new results. Brands and companies that are closely associated with public figures should keep an eye on these SERPs. For those who want to expend minimal effort when typing in a query on Google, you can now refine by common modifiers of the searched keyword all right in the SERPs. We noticed that when searching for broad phrases like “salad dressing” or “women’s shirts” Google presents a “Refine by ___” option that lets users scroll through different options. This update was first noticed by a team member on August 17, and applies to both desktop and mobile. What does this mean? It looks like we weren’t the first to notice this new addition, but this is a relatively new feature to break. How could it impact you? 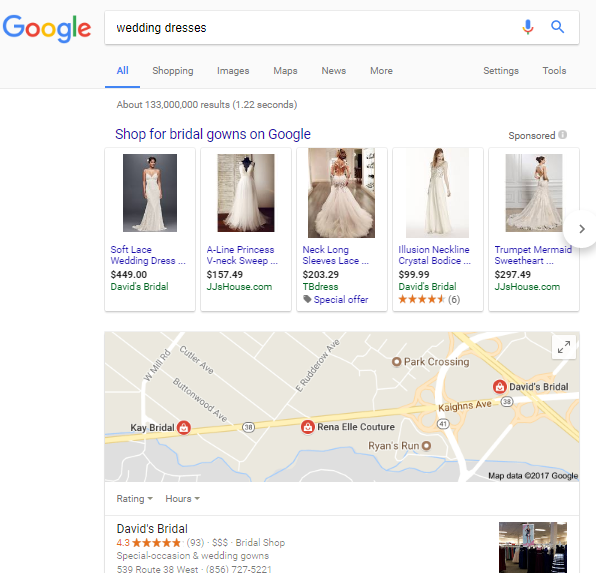 If Google is suggesting competing brands in the modifier suggestions, your business could be missing out if you’re not showing up in these results. It will be interesting to see how structured markup can affect these suggestions. Back in mid-August, one of the Seer team members noticed that a search for the term “salad dressing” (I guess we eat a lot of veggies here) returned a “See Results About” suggestion for “Salad Dressing” that linked to a SERP for the german variant of the query “Salat Sauce”, which when clicked presented German search results. The query was made through desktop on the US version of Google on August 17. What does this mean? At the time of writing, I wasn’t able to replicate this feature and there were no new articles or announcements by Google acknowledging it, so it looks like this may have been a bug that was fixed. This update was first noticed by a team member on August 28, and applies to both desktop and mobile. What does this mean? We weren’t able to find any articles or announcements from Google on this subject, but this could have a significant impact on any PPC campaigns where queries with shopping feeds get more impressions and clicks. While scrolling through Google on their mobile device in late August one of our team members noticed that YouTube video results would start automatically playing a brief six-second preview right in the SERPs. 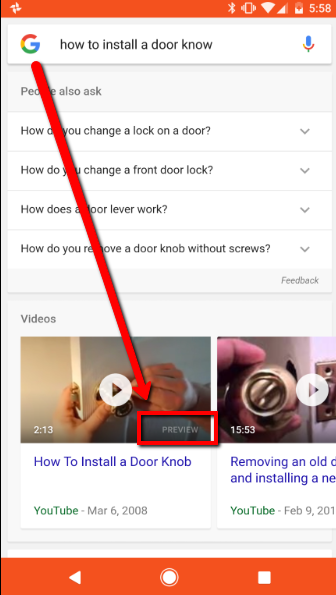 The query that was used was “how to install a door knob” but was also found on other queries where Google returned a YouTube video result. This update was first noticed by a team member on August 28th, and was only available on mobile devices. What does this mean? While it looks like TechCrunch wrote an article on it, at the time of writing I wasn’t able to replicate this. However, this may mean that Google may be rolling this new feature out in waves, or may be testing a select group of users before unleashing it fully into the wild. We saw something similar happen with the somewhat similar “suggested clip” feature we spotted back in May. If your business or your clients have YouTube video results, this may either increase or decrease the CTR depending on the quality of the video and how well it answers the user’s question. If the video is something the user actually wants to see, then you can expect more users to possibly click through to the video. However, if it’s not what they were looking for then users won’t even both clicking on the result. This update was first noticed by Seer on August 19th and only applies to mobile searches. What does this mean? 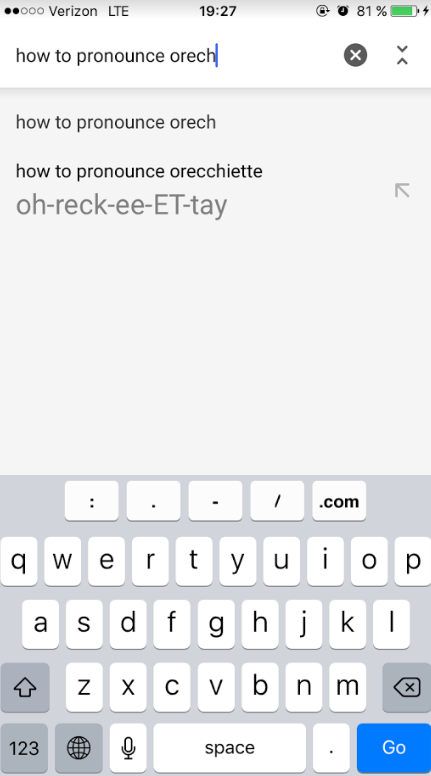 Other than the fact that Italian pastas are hard to pronounce, this could lead to a reduced CTR and traffic to sites who may be targeting pronunciation terms – especially if it spreads to other “how to pronounce…” queries. 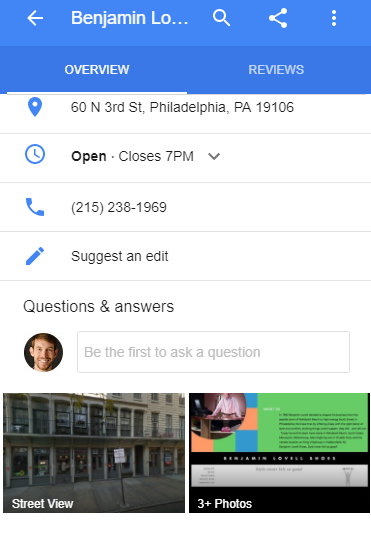 Users who want to directly ask a question about a local business without calling the business themselves up can now do so right from the SERPs on their phone. It looks like Google recently released a new mobile feature that presents a new “Questions & Answers” section under local listings, with a field that users can type in queries and have them answered by anyone. The team member who discovered this feature used the query “shoe store” but it looks like it’s being repeated on a variety of local searches including branded ones. This update was first noticed by a team member on August 29, and currently only applies to mobile searches. What does this mean? We’ve seen this picked up by a few sites including Search Engine Roundtable and Engadget, and it’s also been discussed in Google forums, so this feature may be around to stay. If you or your clients have a physical business location that returns a local result, this may mean that you have to spend more resources & time managing any questions or comments that come in. We’ve seen some results where searchers are using this space to post negative experiences which may turn future visitors away from your site and reduce click-throughs. 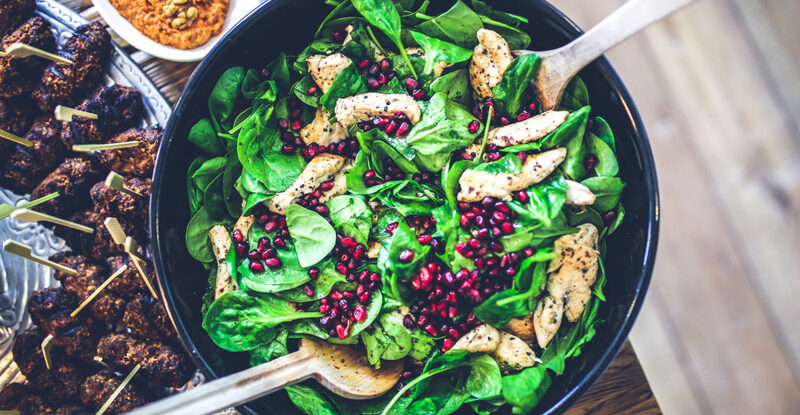 Can’t get enough of our SERP updates and food puns? Sign-up for our newsletter below!